Lifecycle funds are popular investment options. They are choices in almost every retirement and 529 plan I see these days. And this is to say nothing of the many investors who purchase these funds outside of college and retirement plans. But are lifecycle funds good choices? In most cases, no. In one case, yes. Before I explain this further, it’s important to understand the basics of these types of investments. Lifecycle funds are basically “funds of funds.” Within a lifecycle fund you typically find a number of other mutual funds or ETFs. The makeup of these funds ranges from all kinds of equity and fixed income funds. Also, the allocation changes over time. In fact it becomes more and more conservative as the years pass. That’s because each year the manager sells equity funds and buys bond funds. Neal’s Notes: Lifecycle funds are attractive to people who think their money should be invested ultra conservatively once they retire. However, that may not be the case in all situations. Why do lifecycle funds become more conservative each year? Because investors are convinced that is what they want. In fact, that’s the whole point of buying such a fund. Every lifecycle or target date fund has a “maturity date.” The “maturity date” is the point in time when the fund will have basically no equity and all fixed income. If you buy a lifecycle fund with a “maturity date” 10 years from now, the manager will sell a little bit of the equity portion of the fund and buy a little more fixed income every year. The goal is to subject investors to less and less risk. They are of the mind that they accomplish this by reducing the equity exposure and increasing the fixed income holdings. (If you understand how bonds work, you’ll see how this doesn’t always pan out.) This automatic and gradual shift toward fixed income every year is the major selling point of these investments. Neal’s Notes: Lifecyle funds and target date funds are one and the same. Recently, both types of investments have encountered even more problems. In my opinion, these new developments make this catagory of investment much less attractive. Are all lifecycle funds alike? Not at all. Let’s get back to our example above. You may want to retire in 10 years. And Mr. Newbie sitting next to you at work might be 20 years your junior. He’s going to retire in 30 years. The asset allocation of that lifecycle fund will be very different compared to your lifecycle fund. And it doesn’t stop there. Similar lifecycle funds (with similar “maturity dates”) hold very different asset allocations and perform very differently. That’s because each manager makes up his or her mind when it comes to which assets to buy and sell. While you might think that all lifecycle funds are alike, nothing could be further from the truth. When lifecycle funds are a bad idea. In most cases they are stinky choices for you for two reasons. First, these funds don’t deliver in that they really don’t always protect you as they promise. Look at the chart below. 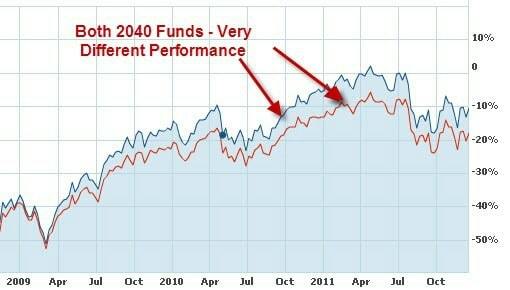 This chart shows a 2020 fund. You would expect this fund to be fairly conservative because it matures in the year 2020. Yet look what investors had to suffer through in 2008-2009. With only 12 years away from retirement, these investors thought they were getting a very conservative investment. But in fact they received quite the opposite. During 2008-2009 they lost almost as much money as the S&P 500 did. And while the overall performance was a bit better than the S&P, investors who bought this fund expected much greater asset protection and didn’t get it. The second problem with these funds is that you rarely know what you are getting. As I mentioned above, you could buy two different funds with the same maturity date and get very different results. See the chart below. This illustrates the point exactly. The reason the performance varies so much is that the assets held within the portfolios were very different. The final reason I suggest you stay away from these funds is that you rarely need a fund that matures as quickly as these funds do. Let’s go back to our example above. Assume you are going to retire in 10 years and you are 55 years old today. But even though you are planning on retiring in 10 years, you will need that money to keep working for you for many more years. It has to work for you as long as you live – not just as long as you work. Just because you retire doesn’t mean your money should retire. What happens with most people who buy these target date or lifecycle funds is that they reinvest the money when they retire. And if they are smart and want more portfolio income, they invest it with at least some of the money in growth funds. So if they own a lifecycle fund, the portfolio becomes increasingly conservative up until the point when the investor retires. Then the investor takes the money and invests it more aggressively. This makes no sense, and it’s the main reason why you should stay away from these funds. When do lifecycle funds make sense? I do like these funds for 529 accounts because they can make some sense. That’s because you know that at a fixed date in the future, you are going to use a good chunk of the money to pay for your child’s education. This is vastly different from retirement accounts. With retirement funds, you actually hope you never need the principal and can live off of the earnings for many years to come. Lifecycle funds are another creation of Wall Street aimed at separating you from your money in most cases. They allow investors to feel good in the short run, but they leave you high and dry over the long term. What say you? Do you own lifecycle funds? Why? What has been your experience? You have no control of what`s in the fund of funds what if you don`t want emerging markets or foreign bonds or any bonds for that matter if those asset classes are performing poorly or if you just dont like the risk associated with them. You may be able to get better returns with less risk by conservatively choosing other funds from your 401 k etc instead of the life cycle fund! Personally, I would shy away from them as asset allocation doesn’t have to be uber complex. It can be so much cheaper to run one’s own portfolio with a couple of etfs and end up achieving the same results [or better hopefully] as these lifecycle funds.